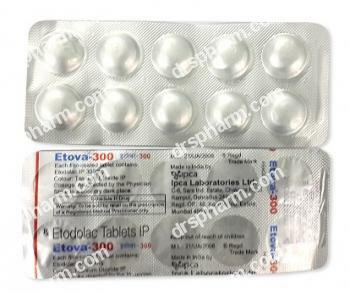 Etodolac is used to treat pain or inflammation caused by arthritis or osteoarthritis. Etodolac is a non-steroidal anti-inflammatory drug (NSAIDs). It works by reducing hormones that cause inflammation and pain in the body. NSAIDs treat the symptoms of pain and inflammation. They do not treat the disease that causes those symptoms. Etodolac is used to treat pain or inflammation caused by arthritis or osteoarthritis. It also reduces pain, swelling, and joint stiffness from arthritis. Take this medication by mouth with a full glass of water (8 ounces or 240 milliliters) unless your doctor directs you otherwise. Do not lie down for at least 30 minutes after taking this drug. If stomach upset occurs while taking this medication, take it with food, milk, or an antacid. Before taking Etodolac, tell your doctor or pharmacist if you are allergic to it; or to aspirin or other NSAIDs (e.g., ibuprofen, naproxen, celecoxib); or if you have any other allergies. Before having surgery, tell your doctor or dentist that you are taking this medication. Before using this medication, tell your doctor or pharmacist your medical history, especially of: kidney disease, liver disease, poorly controlled diabetes, stomach/intestine/esophagus problems (e.g., bleeding, ulcers, recurring heartburn), heart disease (e.g., congestive heart failure, history of heart attack), stroke, high blood pressure, swelling (edema, fluid retention), dehydration, blood disorders (e.g., anemia), bleeding or clotting problems, asthma, growths in the nose (nasal polyps). This medication may be harmful to an unborn baby. Tell your doctor if you are pregnant or plan to become pregnant during treatment. Taking Etodolac during the last 3 months of pregnancy may harm the unborn baby. Do not use any other over-the-counter cold, allergy, or pain medication without first asking your doctor or pharmacist. Do not drink alcohol while taking Etodolac. Do not use this medicine just before or after having heart bypass surgery (also called coronary artery bypass graft, or CABG). This drug should not be used with the following medications because very serious interactions may occur: cidofovir, ketorolac. Before using this medication, tell your doctor or pharmacist of all prescription and nonprescription/herbal products you may use, especially of: anti-platelet drugs, oral bisphosphonates, "blood thinners", corticosteroids, cyclosporine, desmopressin, digoxin, high blood pressure drugs, lithium, methotrexate, pemetrexed, probenecid, SSRI anti-depressants, "water pills" (diuretics such as furosemide, hydrochlorothiazide, triamterene). If you are prescribed this drug on a regular schedule (not just "as needed") and you miss a dose, use it as soon as you remember. If it is near the time of the next dose, skip the missed dose and resume your usual dosing schedule. Do not double the dose to catch up. Store the product at room temperature between 68-77 degrees F (20-25 degrees C). Store the medication away from light and moisture. Do not store in the bathroom. Keep all medicines away from children and pets.